As a young lady of seventeen Ena Barrow enlisted with the WAAFs, by time her training at Wilslow and Cranwell were complete she was eighteen and posted to Middleton St. George as a Teleprinter Operator in the Signals Section . Her main duties were receiving and sending information between the base and No. 6 Headquarters, the information on the upcoming raids would come through the teleprinters. The Station would be asked for a number of aircraft and crews, with details on the bomb loads they were to carry. The Station and Squadron Commanders would complete the lists of aircraft, crews and other details they were supplying, WAAFs such as Ena would then send that data back to HQ by Teleprinter. Although the failure of one of the squadrons aircrews to return would effect everyone on base it was the Teleprinter Operators who first learned of the full details of the loss. As they typed out the forms and sent them to HQ, often they or someone in their barracks knew the men from dances on the base and from the bases main off base distraction The Oak pub. As Ena expressed it in a 2014 interview "you knew you had to get on with what you were doing and not grieve about things" a feeling that many had to develop just to make it through those bad times. She tells of the time a Luftwaffe fighter followed the Lancasters back to base, and she was told along with the others to stay inside while the enemy fighter flew across. Her memory of her thoughts at that moment were "crikey, better get in quick!'" . It brought a brief glimpse up close to her of the war in it's dangerous could be safe one minute and dead the next. Another quite vivid and long staying memory was the final departure of the bases Lancasters as they headed home to Canada. It would not be until 2014 that she would again see one of the Canadian built Lancasters return to Middleton St. George. 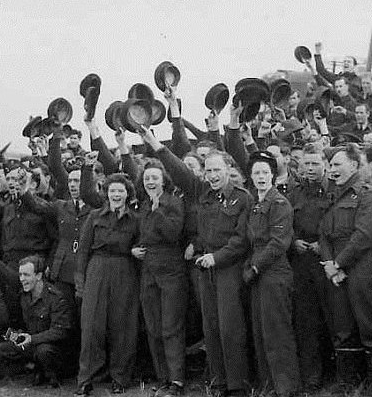 After the return of the Canadian squadrons in 1945, Ena Barrow was posted to RAF Uxbridge and eventually returned to a civilian life in 1947. But this was not the end of her connection with the men of the Canadian squadrons who flew out of MSG, in 1980 the men of the Ground crews of 419 squadron returned for a reunion which she attended, then she and her husband visited Swift Current Saskatchewan in 1981 and Winnipeg in 1983. 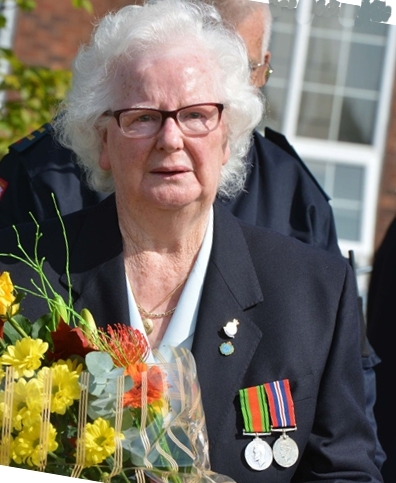 As Ena Bullement she and her husband became involved in the project to erect a memorial at Middleton St. George, by 2005 the statue of Mynarski, a garden and memorial plaque were in place in front of the old Officer's Mess. Although Ena is still seen at the reunions including the latest in 2015, she and her husband who were involved in organizing the reunion events each June have stepped down to enjoy life.